So who is the man behind the moustache? Scott is one of the owners of Phoenix Performance Centre and has been managing the gym with friend and business partner James Saunders since 2010. Many of you will know Scott as a focused, motivated personal trainer who is serious about getting the best results for his clients. What many of you perhaps don’t know is where his passion for personal training comes from and why he is so committed to Phoenix? Scott is supremely confident in his role as a strength coach and body composition specialist but is a bit of an enigma when it comes to his aspirations. So let’s find out more about the man behind the moustache! When did you move to Haywards Heath or have you always lived here? What do you like most about the local area and your clients? How did you meet James and why did you choose Phoenix? “I met James in 2007 while I was working at the Dolphin and looked up to him as he was the most senior PT there. 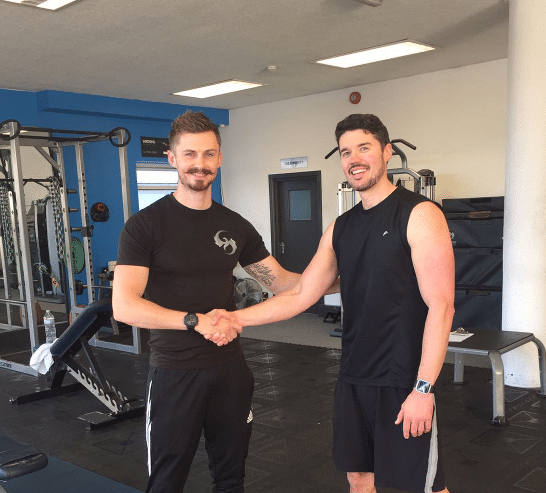 James was also the busiest and most successful personal trainer, his knowledge blew me away, so I worked hard to try to catch up with his knowledge and level of success. Have you always worked in PT or was the move triggered by your personal health/fitness goals? What three things do you think your clients would say about you? “I think they would say that I care about their life problems not just their fitness concerns. I listen to their concerns as often this will help to overcome any obstacles that may be in the way of them making positive changes. I coach them in a way which allows them to see the bigger picture and helps them to make better decisions so we can work towards their ultimate goal. How do you inspire positive change and keep your clients motivated to sustain their results? What are your top 3 tips for anyone wanting to start PT? Be clear about what you want to achieve. Make sure the goal is specific to a number such as weight loss, dress size, body fat percentage and make sure there is a target date set. We work harder when we work towards a deadline, so we achieve results faster. Meeting with them is vital before you commit to signing up. Find out what results they’ve achieved in the past and ask to see how clients have fared once they stopped training. Some coaches tend to slash calories to help clients lose body weight. However, there is often no plan for what happens when you stop eating well and exercising regularly. Typically, I find clients come to me after they have worked with someone else in the past because they put all of the weight back on soon after they stopped working with a coach. People tend to worry that they aren’t fit enough to work with us, this is not the case. If you want to achieve results, we can help you. We work with clients to create the program to suit their abilities. One to one training is all about the person who is front of us, so we’ll do everything we can to ensure your journey is a smooth as possible. What fun or unusual fact would your clients not necessarily know about you? “The thing is, we are all human, which I think can sometimes be forgotten. I love to have fun, go out for food and have a few drinks at the weekend. I love a burger (the bigger, the better) and I do take on the occasional food challenge when I can! I’m often told that I have a strange taste in music and my clients are always keen to let me know this given the opportunity! If I could, I would live off the grid and be completely self-sufficient. I believe that we are forced to live in a society which makes us feel inadequate, and this can lead to many people living fairly miserable lives. I believe in taking ownership of your destiny and that you can create your better future. If you would like to book a FREE consultation with Scott to discuss your personal health and fitness goals, then please get in touch on 01444 810606 or fill in our quick online form and we’ll get straight back to you.